Maize farmers under COCUMAKI, a cooperative in Rwanda’s Rwamagana district, supplied 20 tons of maize in 2016 but a half of them has been rejected for not meeting the standards of the processing plant, according to Ildephonse Musafiri, the representative of the cooperative. Insufficiency of good quality raw materials has been one of major challenges for agro-processing sector in Rwanda, and this results into plants’ processing below their installed capacities or importing expensively raw materials. For instance, Africa Improved Food, a maize flour producer requires more than 28,000 tons of maize every year, but only 51 per cent is outsourced locally. 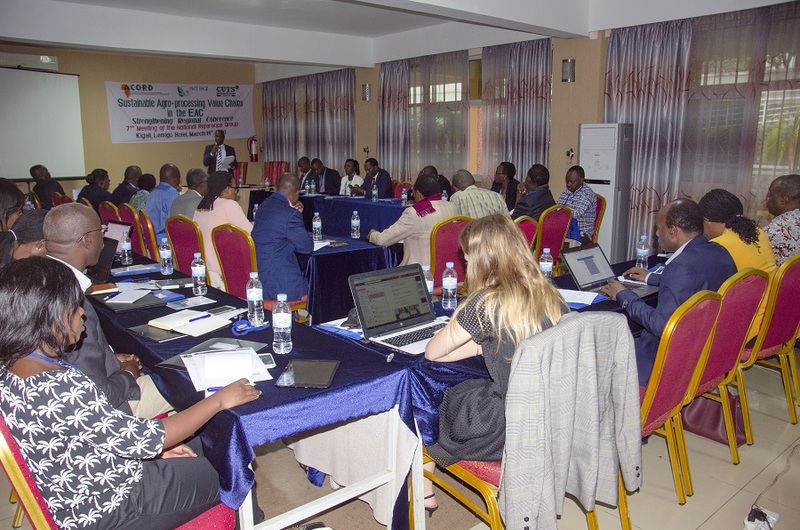 In the 7th National Reference Group (NRG) meeting held on 14th March 2019, organized by ACORD International in partnership with CUTS international, participants raised several issues facing agro-processing including the use of chemical fertilizers, low farmers production for processing facilities, poor quality of the produce and high production costs, among others. The main theme of the conference was “Sustainable Agro-processing Value Chains in the EAC, Strengthening Regional Coherence”. 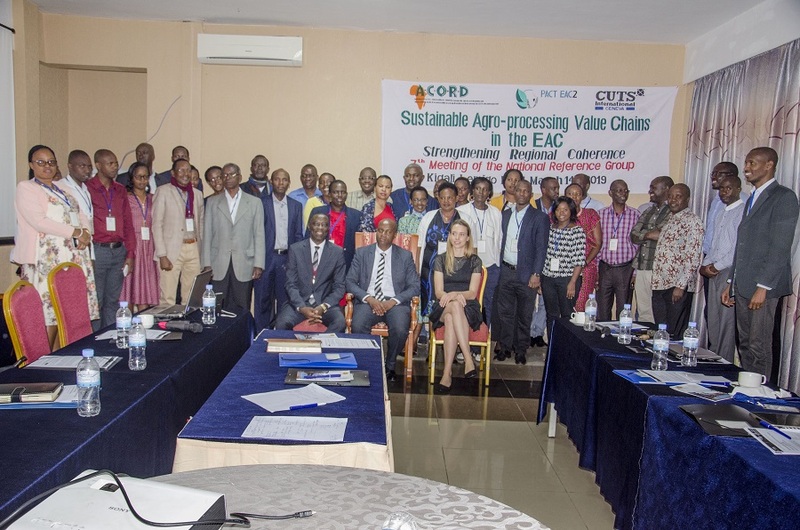 Francois Munyentwari, the Country-Director of ACORD Rwanda, said meeting has been organized to discuss ways to achieve more sustainable agro-processing value chains in the East African region. In this regard, participants have considered the potential contribution of the upcoming regional Private Sector Development Strategy (PSDS), international trade and climate negotiations, as well as relevant cross-cutting issues such as technology and gender. 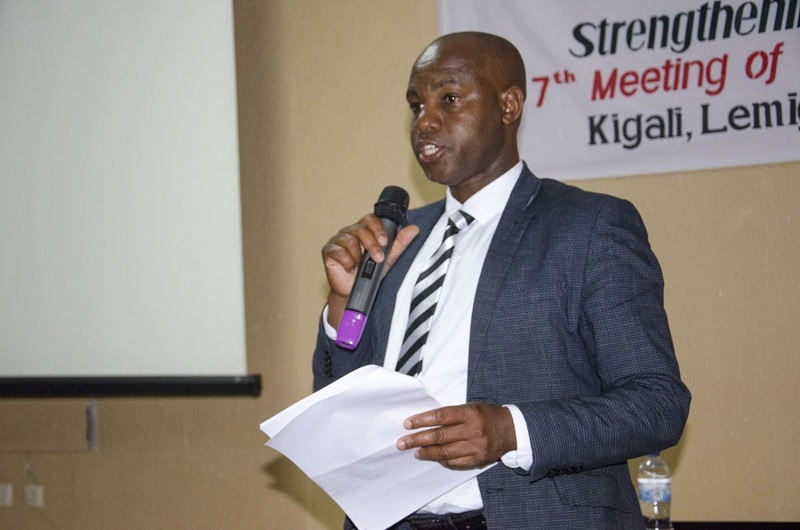 Munyentwari said there is a need of creating linkages between agro-processors-producers and consumers while a specific national forum of agro-processors is fundamental to the development of agroprocessing in Rwanda. In his opening remarks, the Country Director of ACORD told the audience that the priority issues expressed by the agroprocessors across the country include the issue of information and database on agroprocessing (who is processing what and where), the issues of standards /certification of agroprocessed products, to become safe for the consumers and marketable in local and regional markets , the issues of access to raw materials /supply chains (quality, quantity, access), the issues of high cost of production (inputs such as plastic emballages, electricity, taxes), the issues of access to finances (including high interest rates, guarantee, insurance) and the issues related to appropriate technologies (climate friendly). Aloys Gapira, the agribusiness expert who participated in the meeting, said agro-processing sector is still having few actors and most of them are poorly equipped. 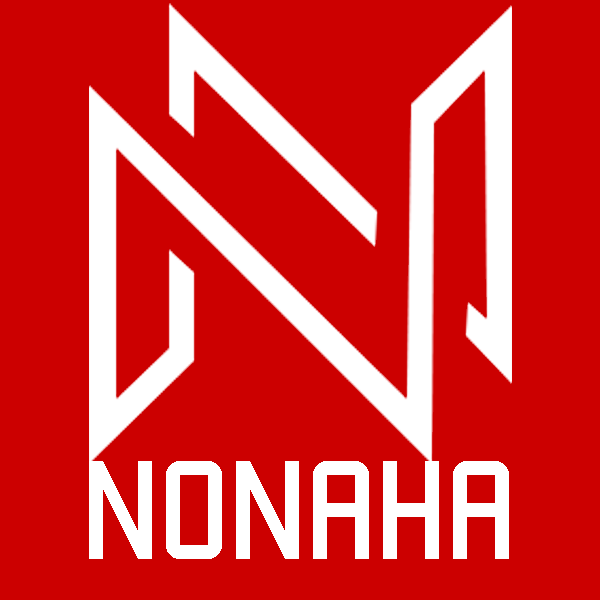 “For many reasons, our processing plants operate at 20 per cent, 50 per cent, … of their capacities. There is need of capacity building in the sector to improve our production in order to meet the requirements of the regional and international markets,” he said. Mr. Gapira thanks ACORD Rwanda for periodically organizing NRG meetings, which is a public and private sector think-tank opportunity. The NRG has a diversity in membership including Law and policy makers, researchers, academicians, media, public officers, project implementers, private sector entrepreneurs in agro processing and agri business, CSO, and donors. “When people meet like this, it is an opportunity to share challenges, weaknesses and opportunities. Deliberations in these meetings help agro-processing actors and policy makers to improve the sector,” he added. Telesphore Mugwiza, Director-General of Industry Development at the Ministry of Trade and industry in Rwanda, said 70% of industries in Rwanda are in agriculture value chains , though, the country spends $118 million every year to import agro-processed products, mainly sugar, fish, cooking oil and rice, among others. The NRG 7 was attended by 53 delegates and officials from the Ministry of trade and Industry, the Ministry of agriculture, representatives of REMA and NIRDA, representative from FAO country office, the PSF and Rwanda association of Manufacturers, the agroprocessors from up country, local and international Civil society members , women groups, farmers associations, media , academicians as well as a delegate from CUTS Geneva. For Advancing interests and capacities of Agroprocessors, there is a need to move from Policies to actions by addressing the key challenges facing the nascent agroprocessing units , especially the lack of adequate knowledge and skills in regards to processing as well as lack of proper information systems on the agro-processing industry. The low level of technology is another big challenge since majority of agro processing work is done manually. Beyond that practical challenge, there a need for a balance between a market oriented /trade agroprocessing and the households’ food security (access to processed foods). The sector of agroprocessing should not be left to profit-led private sector alone, but the Government should invest more in agroprocessing for the sake of food security and safety of the population. Since Agroprocessing is a vital engine for boosting agri production and productivity (contributing to livelihoods of majority of rural citizens), engine for trade and markets, engine for food security (availing secure and safe food), and engine for climate resilient technologies. Yet the current policy tend to leave the agroprocessing sector to the private sector operators, who in most cases are running after profits, whereas so many factors are discouraging private investors to venture in agroprocessing. In regard to the dialogue with WTO and UNFCCC negotiators: What is on for agroprocessing Value chains development? It was recommended to MINICOM and REMA to put in place measures to effectively engage the private sector and stakeholders in WTO and UNFCCC issues in order to better present their interests and fill the current gap /lack of information related to the negotiations. In addition to sensitisation campaign and Talk shows on radio and TVs, it was proposed to Create a national negotiating forum comprising officials from relevant national institutions, private sector, and civil society and to Discuss national matter/positions on a number of issues between the negotiator and the national negotiating forum. Reach out and build up the capacity of nascent agroprocessors for meeting the standards and responding to the issues of food security, malnutrition and stunting at local and national levels.